Binary notation 0b... / 0B... is available on GCC and most but not all C compilers. A variable & initialising it. Multiple variables of the same type. Alphanumeric, not a keyword, begins with a letter. Doesn't begin with a letter. Constants are CAPITALISED. Function names usually take the form of a verb eg. plotRobotUprising(). ±2.3×10-308 to ±1.7×10308 OR alias to float for AVR. Quick access required. May be stored in RAM OR a register. Maximum size is register size. Retained when out of scope. static global variables are confined to the scope of the compiled object file they were declared in. Variable is declared by another file. Returns a as data type. Some types (denoted with OR) are architecture dependant. The stdint.h library was introduced in C99 to give integer types archit­ect­ure­-in­dep­endent lengths. A structure with a recursive structure pointer inside. Useful for linked lists. A variable varName as structure type strctName. A strctName structure type pointer, ptrName. Shorthand for defining strctName and declaring varName as that structure type. A variable varName as structure type strctName and initialising its members. Member x of structure varName. Value of structure pointer ptrName member x. Array members can't be assigned bit fields. Abbreviating a longer type name to uint16. Creating a newType from a structure. Creating an enumerated bool type. Variable x as type uint16. Structure y as type newType. A union type uName with two members, x & y. Size is same as biggest member size. A variable vName as union type uN. Members cannot store values concur­rently. Setting y will corrupt x. Unions are used for storing multiple data types in the same area of memory. A custom data type bool with two possible states: false or true. A variable varName of data type bool. Variable varName can only be assigned values of either false or true. Testing the value of varName. Pointers have a data type like normal variables. They can also have an incomplete type. Operators other than assignment cannot be applied as the length of the type is unknown. An array/­string name can be used as a pointer to the first array element. Value stored in structure pointer y member a. Memory address of normal variable varName. Dereferencing a void pointer as a type pointer. A pointer is a variable that holds a memory location. You set array length and initialise elements. You set array length and initialise all elements to x.
Compiler sets array length based on initial elements. Size cannot be changed after declaration. Value of element int in array name. Elements are contiguously numbered ascending from 0. Memory address of element int in array name. Elements are stored in contiguous memory. Strings must include a char element for \0. Any octal ANSI character code. Any hexadecimal ANSI character code. Function names follow the same restrictions as variable names but must also be unique. Function name and argument parenthesis. Value to return to function call origin. Skip for void type functions. Functions exit immediately after a return. Returning a variable by pointer. Returning an array/string/structure by pointer. The static qualifier is necessary otherwise x won't exist after the function exits. Passing by pointer allows you to change the originating variable within the function. i is declared inside f(), it doesn't exist outside that function. Same type, name and args... as respective function. Semicolon instead of function delimiters. # of command line arguments. Command line arguments in an array of strings. #1 is always the program filename. Exit status (inte­ger) returned to the OS upon program exit. Three arguments, "ap­p", "tw­o" and "3". Two arguments, "ap­p" and "two 3". main is the first function called when the program executes. Evaluates b if a is true. Evaluates b and c if a is true.  Evaluates b if a is true, c otherwise. Evaluates b if a is true, otherwise d if c is true, otherwise e.
Evaluates c if a equals b.
Evaluates b if a matches no other case. Evaluates d if a equals either b or c.
Evaluates c, e and f if a equals b, e and f if a equals d, otherwise f.
Evaluates c if a equals b, e if a equals d and e otherwise. Loop skipped if test condition initially false. Declare and initialise integer x.
Loop keyword and condition parenthesis. Always runs through loop at least once. Declare and initialise character c.
Loop keyword and condition parenthesis. Note semicolon. Skips rest of loop contents and restarts at the beginning of the loop. Skips rest of loop contents and exits loop. Prints a single character from an ANSI code integer to the output stream buffer. Prints a string to the output stream. Prints data (formats defined by the format string) as a string to the output stream. The stream buffers must be flushed to reflect changes. String terminator characters can flush the output while newline characters can flush the input. Safe functions are those that let you specify the length of the input. Unsafe functions do not, and carry the risk of memory overflow. Returns a stream location pointer if successful, 0 otherwise. String containing file's directory path & name. String specifying the file access mode. Write new/over existing text/binary file. Write new/append to existing text/binary file. "r+" / "r+b" / "rb+"
Read and write existing text/binary file. "w+" / "w+b" / "wb+"
Read and write new/over existing text/binary file. "a+" / "a+b" / "ab+"
Read and write new/append to existing text/binary file. Flushes buffers and closes stream. Returns 0 if successful, EOF otherwise. Return current file position as a long integer. Sets current file position. Returns false is successful, true otherwise. The offset is a long integer type. Returns character written or EOF if unsucc­essful. Writes string s to file fptr. Returns non-ne­gative on success, EOF otherwise. Same as printf with additional file pointer parameter. Writes a number of elements to file fptr from array *ptr. Signed decimal w/ scientific notation. Shortest representation of %f/%F or %e/%E. No output, saves # of characters printed so far. Respective printf argument must be an integer pointer. The pointer format is architecture and implementation dependant. Left justify instead of default right justify. Sign for both positive numbers and negative. Precede with 0, 0x or 0X for %o, %x and %X tokens. Minimum number of characters to print: invokes padding if necessary. Will not truncate. Width specified by a preceding argument in printf. Minimum # of digits to print for %d, %i, %o, %u, %x, %X. Left pads with zeroes. Will not truncate. Skips values of 0. Minimum # of significant digits to print for %g & %G. If no integer is given, default of 0. Precision specified by a preceding argument in printf. Display a char as int. Display a short as int. Display a long long integer. Display a long double float. Replaces line with contents of a standard C header file. Replaces line with contents of a custom header file. Note dir path prefix & quotations. Replaces all occurrences of NAME with value. // Nothing compiled after // on these lines. /* I'm a multi-line comment! Returns a memory location if succes­sful, NULL otherwise. Removes the memory allocated to ptrName. Attempts to resize the memory block assigned to ptrName. The memory addresses you see are from virtual memory the operating system assigns to the program; they are not physical addresses. Referencing memory that isn't assigned to the program will produce an OS segmentation fault. Returns a (predictable) random integer between 0 and RAND_MAX based on the randomiser seed. The maximum value rand() can generate. Seeds the randomiser with a positive integer. Returns the computer's tick-tock value. Updates every second. Sort using the QuickSort algorithm. Byte size of each element. Function name unimportant but must return an integer. Argument names unimportant but must identical otherwise. Negative result swaps b for a, positive result swaps a for b, a result of 0 doesn't swap. C's inbuilt randomiser is cryptographically insecure: DO NOT use it for security applications. True if char is a letter of the alphabet, false otherwise. True if char is a lowercase letter of the alphabet, false otherwise. True if char is an uppercase letter of the alphabet, false otherwise. True if char is numerical (0 to 9) and false otherwise. True if char is a whitespace character (' ', '\t', '\n') and false otherwise. Stores a time & date breakdown. Day of the month, 1 to 31. Day of the week, 0 to 6. Day of the year, 0 to 365. Stores the current time in a time_t variable. Returns a time_t variable as a string. Breaks time_t down into struct tm members. Memory size of a (or type) in bytes. Remainder of integers dividend a and divisor b. Sum of a and b. Difference of a and b. Less than. True if a is less than b and false otherwise. Greater than. True if a is greater than than b and false otherwise. Assigns value of a to x.
Wow, this is awesome! Great cheat sheet, really well put together! very nice. Few things- there's no such things as pass by reference in c, even pointers are passed by value. Also mention which sting/I/O functions are safe or not. Good catch on the unsafe functions; I have tagged them as such and also included their safer alternatives. I'm not quite clear on how passing a pointer to data differs from passing a reference to data? Most of the documentation I've seen so far calls the process of retrieving a value through the use of a pointer "dereferencing"? Fixed declaration error in Enumeration. Fixed include error in Preprocessing. Placeholder types are incomplete: what about for example long integer "ul"
In C you receive a copy of the thing you pass. When this thing happens to be a pointer, one may indirectly modify the 'pointed at' thing. In C++ when you pass by reference you receive an alias to the original thing, not a copy. If non-const, when you modify the alias, you modify the thing itself (contrast with C --you never modified the thing itself, only what it pointed at). In float/double, in addition to range, please also add the precision: how many decimal digits they can store. 7 and 15, IIRC.